Passwords are the most common means of authentication, but if you do not choose good passwords or keep them confidential, they are almost as ineffective as not having any password at all. Many systems and services have been successfully broken into due to the use of insecure and inadequate passwords. Some viruses and worms have exploited systems by guessing weak passwords. One good tip for creating a secure password is to use a combination of upper and lower case letters with numerals and symbols interposed that are not related to your birthday, social security number, etc. For example use “Il2pbb!” for I love to play basketball! This mnemonics device adds several layers of security ultimately decreasing your risk of becoming a victim. Tune in next week for ways to protect your password. Every user who has access to a Linux system needs a login and a password. Each user must belong to a primary group and for security or access purposes can belong to several secondary groups. In order to create new logins, modify or delete users, you must already be logged in as root. The root login is the highest level and only certain individuals should have access to the root account. Each field is separated by a colon. Passwords for each user are stored in /etc/shadow. This file should only be changed using the passwd command. When a new user is created, the default files and directories that are created are stored in /etc/skel. This directory can be modified to fit your needs. Modifications only effect new users and does not change anything for existing users. To switch to another user, use the su command. This is most commonly used to switch to the root account. The easy way provides date, time and timezone information. If you want to display the date only, the following way will do that. Before reviewing the below recommendations and suggestions, verify that the files have actually been deleted; in some cases the files may have simply been moved. You can search the hard disk drive for the files you believe to be missing by running find or search on the computer. If the file has been backed up to floppy disk or other medium it is recommended that the file be restored from that backup if the file cannot be found. If you are running Apple MacOS, Microsoft Windows 95, NT, 98, 2000, ME, XP, Vista, or later operating system and the file has been recently deleted it is possible that the file may still be in the Trash or Recycle Bin. If present within this area it can be recovered. Below is a list of freeware file recovery programs that can be used freely to recover lost data. In addition to the above freeware programs there are also several companies who have created programs designed to recover your lost data. For example, PowerQuest makes the utility Drive Image that in some cases can be used to recover data from a hard drive. Utilize the service of a local data recovery company or an out of state data recovery company. One word of caution is that these services can sometimes be very expensive. It is only recommended they be used if the data is extremely important. Below is a listing of a few major data recovery companies. There are also several companies that specialize in the service of recovering files or documents that are password protected. Below is a listing of some of the companies that provide this service. 1. Select parent folder of deleted item by clicking on to it and highlighting it. New-OWAVirtualDirectory -OwaVersion:Exchange2007 -Name "owa" -WebSite "Default Web Site"
New-OWAVirtualDirectory -OwaVersion:Exchange2007 -Name "owa" -WebSite "Exchange.1701media.com"
# echo Date = "$DATE"
# echo Source = "$SOURCE"
# echo Target = "$TARGET"
# echo Age = "$AGE"
### The "\;" tells exec that's the end of the statement. ### If you want to remove files with specific names or extensions use the "-name" argument. Give user privilages for a db. UPDATE: See BackTrack 4 Pre-Release Hard Disk Install for updated instructions for the newer BackTrack 4 Beta. Backtrack 4 does not contain an installer, so we wrote this step by step guide based on muts cookbook on how to install Backtrack 4 on our hard disk drive. Enter 'n' for new partition. Press Enter to accept default First cylinder. Enter Size: '+32G' NOTE: I used 32GB, you can use a size you prefer. 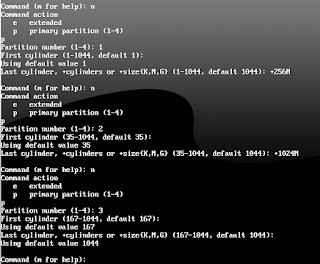 - Select 'p' to print the partition table and verify newly created partitions. Type 'w' to write changes and exit fdisk. I formated my file system with mkreiserfs for root partition, ext2 for boot and swap for the swap partition. Now its time to copy over the backtrack files to the hard drive and configure it to run the backtrack on boot. We will need to configure /etc/lilo.conf and define the boot and root partition so we will be able to boot into backtrack. In case we do not correctly define the root partition we will get an error “Kernel panic: no init found”. NOTE: lilo may not be installed, if not make sure you are connected to the Internet (use ifconfig to view IP address, etc., and dhclient to renew IP address if necessary). Once connected run the following to install lilo. It seems to be your first LILO installation. It is absolutely necessary to run liloconfig(8) when you complete this process and execute /sbin/lilo after this. LILO won't work if you don't do this. So, select OK then run liloconfig, then /sbin/lilo. If you get the message, "fatal: cannot open: /etc/lilo.conf" you are basically screwed and need to search for a solution. Iwconfig is similar to ifconfig(8), but is dedicated to the wireless interfaces. It is used to set the parameters of the network interface which are specific to the wireless operation (for Example: the frequency). Iwconfig may also be used to display those parameters, and the wireless statistics (extracted from /proc/net/wireless). All these parameters and statistics are device dependent. Each driver will provide only some of them depending on hardware support, and the range of values may change. Please refer to the man page of each device for details. Set the ESSID (or Network Name - in some products it may also be called Domain ID). The ESSID is used to identify cells which are part of the same virtual network. As opposed to the AP Address or NWID which define a single cell, the ESSID defines a group of cells connected via repeaters or infrastructure, where the user may roam transparently. With some cards, you may disable the ESSID checking (ESSID promiscuous) with off or any (and on to reenable it). If the ESSID of your network is one of the special keywords (off, on or any), you should use -- to escape it. iwconfig eth0 essid "My Network"
Set the Network ID (in some products it may also be called Domain ID). As all adjacent wireless networks share the same medium, this parameter is used to differenciate them (create logical colocated networks) and identify nodes belonging to the same cell. This parameter is only used for pre-802.11 hardware, the 802.11 protocol uses the ESSID and AP Address for this function. With some cards, you may disable the Network ID checking (NWID promiscuous) with off (and on to reenable it). quency. In Ad-Hoc mode, the frequency setting may only be used at initial cell creation, and may be ignored when joining an existing cell. You may also use off or auto to let the card pick up the best channel (when supported). Set the sensitivity threshold. This is the lowest signal level for which the hardware will consider receive packets usable. Positive values are assumed to be the raw value used by the hardware or a percentage, negative values are assumed to be dBm. Depending on the hardware implementation, this parameter may control various functions. This parameter may control the receive threshold, the lowest signal level for which the hardware attempts packet reception, signals weaker than this are ignored. This may also controls the defer threshold, the lowest signal level for which the hardware considers the channel busy. Proper setting of those thresholds prevent the card to waste time receiving background noise. Modern designs seems to control those thresholds automatically. On modern cards, this parameter may control handover/roaming threshold, the lowest signal level for which the hardware remains associated with the current Access Point. When the signal level goes below this threshold the card starts looking for a new/better Access Point. Set the operating mode of the device, which depends on the network topology. The mode can be Ad-Hoc (network composed of only one cell and without Access Point), Managed (node connects to a network composed of many Access Points, with roaming), Master (the node is the synchronisation master or acts as an Access Point), Repeater (the node forwards packets between other wireless nodes), Secondary (the node acts as a backup master/repeater), Monitor (the node is not associated with any cell and passively monitor all packets on the frequency) or Auto. Force the card to register to the Access Point given by the address, if it is possible. When the quality of the connection goes too low, the driver may revert back to automatic mode (the card selects the best Access Point in range). You may also use off to re-enable automatic mode without changing the current Access Point, or you may use any or auto to force the card to reassociate with the currently best Access Point. Set the nickname, or the station name. Some 802.11 products do define it, but this is not used as far as the protocols (MAC, IP, TCP) are concerned and completely useless as far as configuration goes. Only some diagnostic tools may use it. iwconfig eth0 nickname "My Linux Node"
For cards supporting multiple bit rates, set the bit-rate in b/s. The bit-rate is the speed at which bits are transmitted over the medium, the user speed of the link is lower due to medium sharing and various overhead. You may append the suffix k, M or G to the value (decimal multiplier : 10^3, 10^6 and 10^9 b/s), or add enough ’0’. Values below 1000 are card specific, usually an index in the bit-rate list. Use auto to select automatic bit-rate mode (fallback to lower rate on noisy channels), which is the default for most cards, and fixed to revert back to fixed setting. If you specify a bit-rate value and append auto, the driver will use all bitrates lower and equal than this value. RTS/CTS adds a handshake before each packet transmission to make sure that the channel is clear. This adds overhead, but increases performance in case of hidden nodes or a large number of active nodes. This parameter sets the size of the smallest packet for which the node sends RTS ; a value equal to the maximum packet size disables the mechanism. You may also set this parameter to auto, fixed or off. Fragmentation allows to split an IP packet in a burst of smaller fragments transmitted on the medium. In most cases this adds overhead, but in a very noisy environment this reduces the error penalty and allow packets to get through interference bursts. This parameter sets the maximum fragment size ; a value equal to the maximum packet size disables the mechanism. You may also set this parameter to auto, fixed or off. Used to manipulate encryption or scrambling keys and security mode. To set the current encryption key, just enter the key in hex digits as XXXX-XXXX-XXXX-XXXX or XXXXXXXX. To set a key other than the current key, prepend or append [index] to the key itself (this won’t change which is the active key). You can also enter the key as an ASCII string by using the s: prefix. Passphrase is currently not supported. To change which key is the currently active key, just enter [index] (without entering any key value). off and on disable and reenable encryption. The security mode may be open or restricted, and its meaning depends on the card used. With most cards, in open mode no authentication is used and the card may also accept non-encrypted sessions, whereas in restricted mode only encrypted sessions are accepted and the card will use authentication if available. If you need to set multiple keys, or set a key and change the active key, you need to use multiple key directives. Arguments can be put in any order, the last one will take precedence. Used to manipulate power management scheme parameters and mode. To set the period between wake ups, enter period ???value???. To set the timeout before going back to sleep, enter timeout ???value???. You can also add the min and max modifiers. By default, those values are in seconds, append the suffix m or u to specify values in milliseconds or microseconds. Sometimes, those values are without units (number of beacon periods, dwell or similar). off and on disable and reenable power management. Finally, you may set the power management mode to all (receive all packets), unicast (receive unicast packets only, discard multicast and broadcast) and multicast (receive multicast and broadcast only, discard unicast packets). behaviour of the retry mechanism. specify values in milliseconds or microseconds. You can also add the min and max modifiers. If the card supports automatic mode, they define the bounds of the limit or lifetime. Some other cards define different values depending on packet size, for example in 802.11 min limit is the short retry limit (non RTS/CTS packets). Some cards may not apply changes done through Wireless Extensions immediately (they may wait to aggregate the changes or apply it only when the card is brought up via ifconfig). This command (when available) forces the card to apply all pending changes. This is normally not needed, because the card will eventually apply the changes, but can be useful for debugging. For each device which supports wireless extensions, iwconfig will display the name of the MAC protocol used (name of device for proprietary protocols), the ESSID (Network Name), the NWID, the frequency (or channel), the sensitivity, the mode of operation, the Access Point address, the bit-rate, the RTS threshold, the fragmentation threshold, the encryption key and the power management settings (depending on availability). The parameters displayed have the same meaning and values as the parameters you can set, please refer to the previous part for a detailed explanation of them. Some parameters are only displayed in short/abbreviated form (such as encryption). You may use iwlist(8) to get all the details. Some parameters have two modes (such as bitrate). If the value is prefixed by ‘=’, it means that the parameter is fixed and forced to that value, if it is prefixed by ‘:’, the parameter is in automatic mode and the current value is shown (and may change). An address equal to 00:00:00:00:00:00 means that the card failed to associate with an Access Point (most likely a configuration issue). The Access Point parameter will be shown as Cell in ad-hoc mode (for obvious reasons), but otherwise works the same. If /proc/net/wireless exists, iwconfig will also display its content. Note that those values will depend on the driver and the hardware specifics, so you need to refer to your driver documentation for proper interpretation of those values. Overall quality of the link. May be based on the level of contention or interference, the bit or frame error rate, how good the received signal is, some timing synchronisation, or other hardware metric. This is an aggregate value, and depends totally on the driver and hardware. Received signal strength (RSSI - how strong the received signal is). May be arbitrary units or dBm, iwconfig uses driver meta information to interpret the raw value given by /proc/net/wireless and display the proper unit or maximum value (using 8 bit arithmetic). In Ad-Hoc mode, this may be undefined and you should use iwspy. Background noise level (when no packet is transmitted). Similar comments as for Signal level. Number of packets received with a different NWID or ESSID. Used to detect configuration problems or adjacent network existence (on the same frequency). Number of packets that the hardware was unable to decrypt. This can be used to detect invalid encryption settings. Number of packets for which the hardware was not able to prop erly re-assemble the link layer fragments (most likely one was missing). Number of periodic beacons from the Cell or the Access Point we have missed. Beacons are sent at regular intervals to maintain the cell coordination, failure to receive them usually indicates that the card is out of range. ifconfig, iwspy, iwlist, iwevent, iwpriv, wireless. If your change is only temporary, or you want to make it without rebooting, you just need to use the hostname command, which can be found at /bin/hostname. Running it without arguments just outputs the current hostname. To change it, su to root and run hostname newhostname. If that doesn't do it, you can modify /proc/sys/kernel/hostname to modify it on the fly. If that doesn't do it, reboot the machine after making those changes and it should come back up with the new hostname. This document how to allow remote access VPN connections to the ASA from the Cisco AnyConnect 2.0 client. The Cisco AnyConnect 2.0 client is an SSL-based VPN client. The AnyConnect client can be utilized and installed on a variety of operating systems, such as Windows 2000, XP, Vista, Linux (Multiple Distros) and MAC OS X. The AnyConnect client can be installed manually on the remote PC by the system administrator. It can also be loaded onto the security appliance and made ready for download to remote users. After the application is downloaded, it can automatically uninstall itself after the connection terminates, or it can remain on the remote PC for future SSL VPN connections. This example makes the AnyConnect client ready to download upon successful browser-based SSL authentication. For more information on the AnyConnect 2.0 client, refer to AnyConnect 2.0 Release Notes. Note: MS Terminal Services is not supported in conjunction with the AnyConnect client. You cannot RDP to a computer and then initiate an AnyConnect session. You cannot RDP to a client that is connected via AnyConnect. Note: The first installation of AnyConnect requires the user to have admin rights (whether you use the standalone AnyConnect msi package or push the pkg file from the ASA). If the user does not have admin rights, a dialog box appears that states this requirement. Subsequent upgrades will not require the user that installed AnyConnect previously to have admin rights. By default, the security appliance has a self-signed certificate that is regenerated every time the device is rebooted. You can purchase your own certificate from vendors, such as Verisign or EnTrust, or you can configure the ASA to issue an identity certificate to itself. This certificate remains the same even when the device is rebooted. Complete this step in order to generate a self-issued certificate that persists when the device is rebooted. Click Configuration, and then click Remote Access VPN. Expand Certificate Management, and then choose Identity Certificates. Click Add, and then click the Add a new identity certificate radio button. In the Add Key Pair dialog box, click the Enter new key pair name radio button. Enter a name to identify the keypair. In the Add Identity Certificate dialog box, ensure the newly created key pair is selected. For Certificate Subject DN, enter the fully qualified domain name (FQDN) that will be used to connect to the VPN terminating interface. Click Advanced, and enter the FQDN used for the Certificate Subject DN field. Check the Generate Self Signed Certificate check box, and click Add Certificate. Expand Advanced, and choose SSL Settings. In the Certificates area, choose the interface that will be used to terminate the SSL VPN (outside), and click Edit. In the Certificate drop-down list, choose the self-signed certificate that you generated earlier. This document uses the AnyConnect SSL 2.0 client. You can obtain this client at the Cisco Software Download Website. A separate Anyconnect image is required for each operating system that remote users plan to use. For more information, refer to Cisco AnyConnect 2.0 Release Notes. Expand Network (Client) Access, and then expand Advanced. Expand SSL VPN, and choose Client Settings. In the SSL VPN Client Images area, click Add, and then click Upload. Browse to the location where you downloaded the AnyConnect client. Select the file, and click Upload File. Once the client uploads, you receive a message that states the file was uploaded to flash successully. A dialog box appears to confirm that you want to use the newly uploaded image as the current SSL VPN client image. Repeat the steps in this section for each operating system-specific Anyconnect package that you want to use. In order to allow the AnyConnect client to connect to the ASA, you must enable access on the interface that terminates SSL VPN connections. This example uses the outside interface in order to terminate Anyconnect connections. Expand Network (Client) Access, and then choose SSL VPN Connection Profiles. Check the Enable Cisco AnyConnect VPN Client check box. Check the Allow Access check box for the outside interface, and click Apply. A group policy specifies the configuration parameters that should be applied to clients when they connect. This example creates a group policy named SSLClientPolicy. Expand Network (Client) Access, and choose Group Policies. Choose General, and enter SSLClientPolicy in the Name field. Uncheck the Address Pools Inherit check box. Click Select, and then click Add. The Add IP Pool dialog box appears. Configure the address pool from an IP range that is not currently in use on your network. Choose the newly created pool, and click Assign. Click OK, and then click More Options. Uncheck the Tunneling Protocols Inherit check box. In the left pane, choose Servers. Uncheck the DNS Servers Inherit check box, and enter the IP address of the internal DNS server that the AnyConnect clients will use. Uncheck the Default Domain Inherit check box. Enter the domain used by your internal network. For example, tsweb.local . When you enable this option, you allow the SSL/IPsec clients to bypass the interface access list. Expand SSL VPN, and choose Bypass Interface Access List. Ensure the Enable inbound SSL VPN and IPSEC Sessions to bypass interface access lists check box is checked, and click Apply. When VPN clients connect to the ASA, they connect to a connection profile or tunnel group. The tunnel group is used to define connection parameters for specific types of VPN connections, such as IPsec L2L, IPsec remote access, clientless SSL, and client SSL. Expand Network (Client) Access, and then expand SSL VPN. Choose Connection Profiles, and click Add. Ensure the SSL VPN Client Protocol check box is checked. In the left pane, expand Advanced, and choose SSL VPN. Under Connection Aliases, click Add, and enter a name to which users can associate their VPN connections. For example, SSLVPNClient. At the bottom of the ASDM window, check the Allow user to select connection, identified by alias in the table above at login page check box, and click Apply. NAT exemption should be configured for any IP addresses or ranges you want to allow the SSL VPN clients to access. In this example, the SSL VPN clients need access to the internal IP 192.168.50.5 only. Note: If NAT-control is not enabled, this step is not required. Use the show run nat-control command to verify. In order to verify through ASDM, click Configuration, click Firewall, and choose Nat Rules. If the Enable traffic through the firewall without address translation check box is checked, you can skip this step. Click Configuration, and then click Firewall. Choose Nat Rules, and click Add. If you use local authentication (the default), you must define user names and passwords in the local database for user authentication. Expand AAA Setup, and choose Local Users. Select the No ASDM, SSH, Telnet or Console Access radio button. Repeat this step for additional users, and then click Save. Use the show vpn-sessiondb svc command in order to verify connected SSL VPN clients. The vpn-sessiondb logoff name username command logs off users by user name. An Administrator Reset message is sent to the user when disconnected. I started with a clean drive, so you might have to manipulate your partition tables. I’m going to assume that you’re comfortable working with partition tables. If not, work on your google-fu. 1. Boot system from Backtrack 3 CD. NOTE: Format A and C using mkfs.ext3 /dev/sda1 and mkfs.ext3 /dev/sda3. REMEMBER: hd0,2 would be for partition 3 NOT 2. Change accordingly! battery life is known to be excellent on many BlackBerry models. However, other models often have shorter battery life. Try this if you are a new BlackBerry owner. 1. You need to break in the BlackBerry battery. Charge-discharge it fully about 3 times. This will max the battery life of a fresh, new Lithium ion. Note: once you do that, don't get in the habit of fully discharging the battery everytime -- to prevent wearing it out -- lithium batteries can be damaged with excessive deep discharges like a car battery can be.... When breaking in the battery, make sure you keep it plugged in long after the battery says it is fully charged (i.e. overnight), you really want to trickle-charge your BlackBerry to top-off your battery. 2. Lithium batteries LOVE to be topped-off. In regular use (After initial first-use conditioning), plug it in whenever you have the opportunity. This will also help keep the battery life maxed out for those days you really need long battery life. 3. If you are constantly starved for battery power, avoid continuously realtime software such as BBToday software; it uses a lot of battery power. 4. Keep your Bluetooth turned off when not in use. 5. If you use instant messaging software, leave it running in the background or quit it when not in use. Also, stay logged off the networks you do not use much. 6. When using your BlackBerry, make sure you keep the backlight turned low or off whenever possible (rather than bright mode). 7. Some BlackBerries have an extended battery available, such as the Nextel 7510. There may be an extended battery product for your specific BlackBerry product. 8. There's the novelty factor of using a BlackBerry for the first time; we tend to play with them much more heavily at first. So your usage may normallize after you get used to it. 9. If you haven't bought a BlackBerry yet, you should be aware that the GSM/GPRS BlackBerries have the longest battery life. Battery life is longer on GPRS BlackBerries than the CDMA and iDEN BlackBerries. 10. Phone calls made on your BlackBerry is the biggest consumer of battery life. If you make lots of phone calls for hours, then your battery life can be extremely short. Making phone calls in areas of weak reception will also use up more battery power. 11. Consider a car power kit, or an office charger/cable. That way, you have more opportunities to top-off your BlackBerry battery. As noted earlier, it's always a good idea to top-off the battery in a BlackBerry anyway, even if it's not almost dead. It is not necessary to follow the age-old advice of using up the battery before charging, and can wear out modern lithium-ion batteries if done on a constant basis. 12. Your battery may be defective or worn out. Compare your battery life to other people using the same model of BlackBerry. If you have been using your BlackBerry for a long time, it may be time to replace your battery. If you purchased your BlackBerry as used, you may want to replace the battery with a new one. For best battery life, it is generally best to use genuine brand-name batteries rather than inexpensive aftermarket batteries. 13. Occasionally, it may be a BlackBerryOS issue if you are having unusually short battery life all the time. Early versions of BlackBerryOS on the 7100 tended to use a lot more battery life than newer versions of BlackBerryOS. Upgrade to a newer version of BlackBerryOS. --- View actively running commands by SPID. Problem: Batch file running Perl script to parse and copy SQL log files every five minutes as a Scheduled Task in Windows was creating a DOS window on the console. This made working on the server difficult and dangerous. The old batch file must have the command 'exit' at the end of it for the DOS window to close. To change this on a given domain controller, go to "Start" ->"Administrative Tools" -> "Domain Controller Security Policy" (not Domain Policy) and look for "Security Settings" -> "Local Policies" -> "Security Options" -> "Microsoft network server: Digitally sign communications (always)". It should show "Enabled" by default. Double-click on it and set to "Disabled". Then close the app and click on start | Run - enter the command 'gpudate' to refresh group policy and hit enter. # List of DBBNAMES for Monthly Backups. # Additionally keep a copy of the most recent backup in a seperate directory. # this backup script when a new DB is created). # with a % e.g. "data base" will become "data%base"
# NOTE: Spaces in DB names may not work correctly when SEPDIR=no. # you like by using the BACKUPDIR setting..
# email addresses in a space seperated list. # the console or to the cron job owner if run through cron. If you set it to "quiet"
# MAXATTSIZE to be 25% smaller than that so a setting of 4000 would probably be fine. # by cron e.g just name the file "automysqlbackup"
# wise this option will not be used. # exclude some of them. (eg. a db is to big). # a database with the same name as the original database when restoring. # in case of single DB corruption or loss). # The default is 6 which means that weekly backups are done on a Saturday. # COMP is used to choose the copmression used, options are gzip or bzip2. # may take longer to complete. # location so it can be downloaded bt thrid party scripts. # to increase the MAX_ALLOWED_PACKET setting, for example 16MB..
# or scripts to perform tasks either before or after the backup process. # copy of the backup has not be stored offline or on another PC..
# You should copy your backups offline regularly for best protection. # Firstly you will need to uncompress the backup file. # you are piping the file.sql to mysql and not the other way around. # Should not need to be modified from here down!! if [ ! -e "$BACKUPDIR" ] # Check Backup Directory exists. if [ ! -e "$BACKUPDIR/daily" ] # Check Daily Directory exists. if [ ! -e "$BACKUPDIR/weekly" ] # Check Weekly Directory exists. if [ ! -e "$BACKUPDIR/monthly" ] # Check Monthly Directory exists. if [ ! -e "$BACKUPDIR/latest" ] # Check Latest Directory exists. # IO redirection for logging. exec 6>&1 # Link file descriptor #6 with stdout. exec > $LOGFILE # stdout replaced with file $LOGFILE. exec 7>&2 # Link file descriptor #7 with stderr. exec 2> $LOGERR # stderr replaced with file $LOGERR. echo Backup Information for "$1"
echo Compression information for "$1.bz2"
echo "No compression option set, check advanced settings"
DBNAMES="`mysql --user=$USERNAME --password=$PASSWORD --host=$DBHOST --batch --skip-column-names -e "show databases"| sed 's/ /%/g'`"
MDB="`echo $MDB | sed 's/%/ /g'`"
if [ ! -e "$BACKUPDIR/monthly/$MDB" ] # Check Monthly DB Directory exists. DB="`echo $DB | sed 's/%/ /g'`"
if [ ! -e "$BACKUPDIR/daily/$DB" ] # Check Daily DB Directory exists. if [ ! -e "$BACKUPDIR/weekly/$DB" ] # Check Weekly DB Directory exists. echo Total disk space used for backup storage..
exec 1>&6 6>&- # Restore stdout and close file descriptor #6.
exec 1>&7 7>&- # Restore stdout and close file descriptor #7. # Include error log if is larger than zero. ERRORNOTE="WARNING: Error Reported - "
echo "Errors reported during AutoMySQLBackup execution.. Backup failed"